Photo by Kim Yong Kwan. At first glance, Healing Stay KOSMOS looks like it came straight out of a science fiction movie where man, fleeing some global calamity in the distant future, has settled on a new, pristine, earth-like planet. Contrary to appearances, this filmic setting is located on Earth, specifically, on a volcanic island 120 kilometres east of the Korean Peninsula. Featuring a dense landscape of mountain peaks, caves and waterfalls encircled by rocky shorelines—a setting not unlike the remote island in Jurassic Park—it makes for the ideal backdrop for Healing Stay KOSMOS, a luxury resort where guests can relax in an utopian venue throbbing with the rejuvenating energy of the otherworldly landscape and serenity of the wide open sky. Sitting atop a large underwater stratovolcano in the East Sea, the South Korean island of Ulleungdo is blessed with a spectacular topography and a unique local ecology that provides a scenic setting for walks, hikes and boat rides as well as an ideal location to sit back and observe the celestial phenomena. But more than that, Ulleungdo is also known for the potent “chi” energy fields whose rejuvenation power is said to flow through the island. In this respect, KOSMOS couldn’t be more ideally located on the side of Songgot-bong, or “Ice Pick peak”, a rock formation that looks as awesome as it sounds. And if that wasn’t enough, the resort is built on the edge of a cliff that plunges dramatically thirty metres down to the sea, with great views of Elephant Rock, a rock formation in the middle of the sea in the shape of an elephant with its trunk dipped in the water. 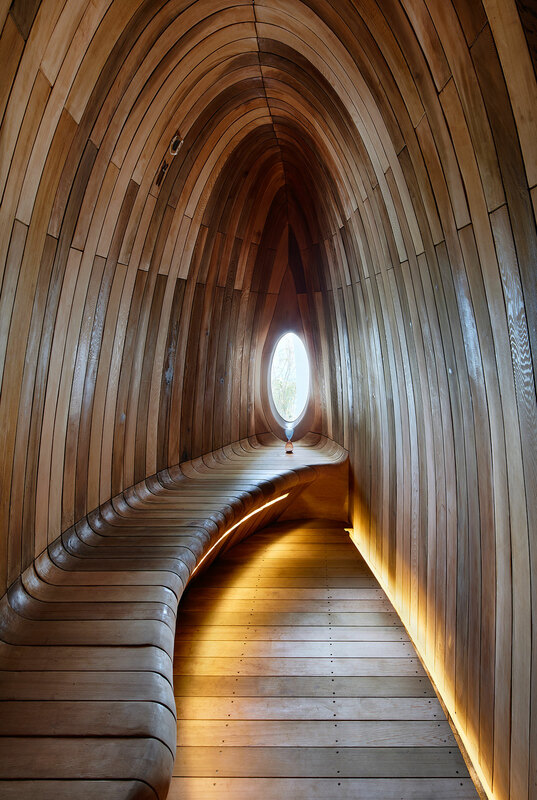 The unique setting demanded a one-of-a-kind architectural statement that Chanjoong Kim of Korean architects THE_SYSTEM LAB more than delivered with his futuristic design of fluid plasticity and elegant slenderness. 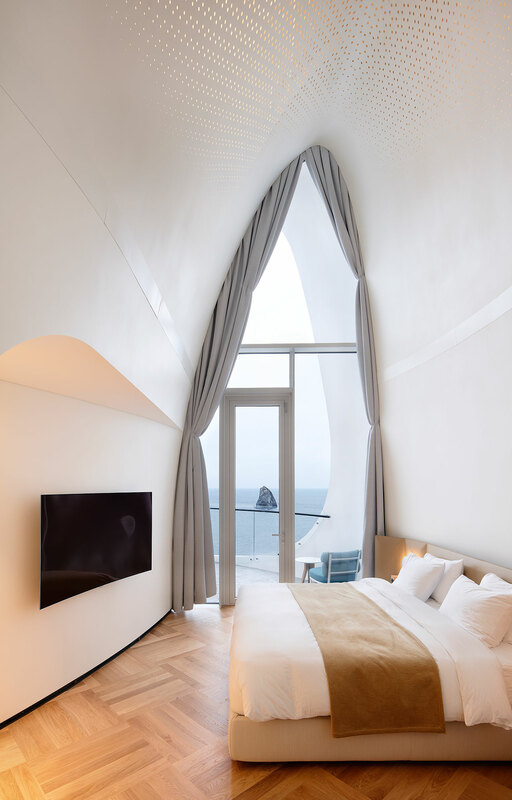 Conceived as a “container of energy” and inspired by the celestial swirl of planets and stars, Healing Stay KOSMOS resort has been designed as an observatory of the cosmos, hence its name, with each guestroom and communal space meticulously orientated according to a specific view. Made from ultra-high performance concrete, the resort’s two snow-white buildings, Villa Kosmos and Villa Terra, have been sculpted into curvaceous compositions that allude both to the celestial movements of the sun and moon, and to the rolling landscape. 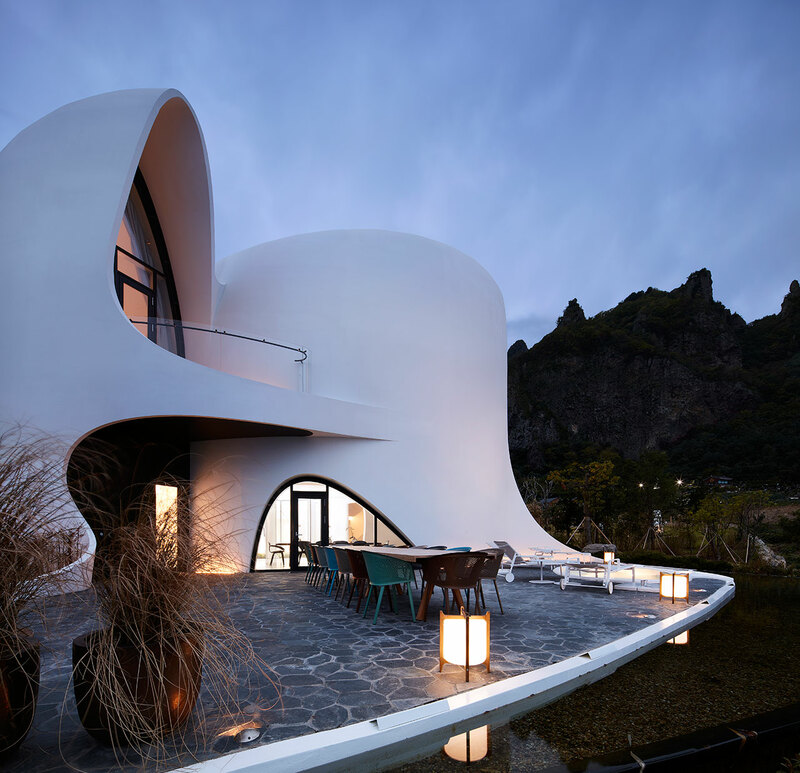 With its seashell-like swirling shape of slender folds, Villa Kosmos is the more dramatic of the development’s two buildings. Available to rent only as a whole, it contains four high-ceiling guestrooms and spacious communal areas whose minimalist interior design has been inspired by the Taoist concept of the Five Elements, or Wu Xin — Wood, Earth, Water, Fire, and Metal — which represent the five dynamic qualities or energies that can be perceived in all natural phenomena. Each space is thus dominated by one element and identified by the corresponding planet: Jupiter, Saturn, Mercury, Mars and Venus. Sporting a neutral palette of blue-grey for the stone floors and white for the swooping and dipping walls and ceilings, the communal spaces on the ground floor are sparsely furnished with contemporary pieces allowing the views to take centre stage. 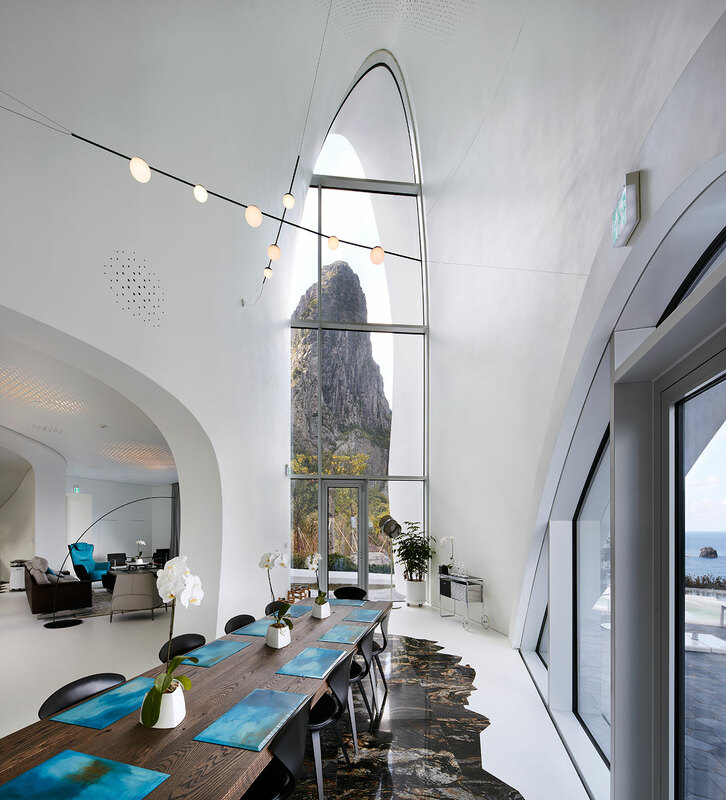 In the lounge, guests can relax in front of the magnificent vista of the Elephant Rock whereas in the cathedral-like dining room they can sit around the bespoke oak dining table in front of Songgot-bong, perfectly framed by the lanky shape of the glazed façade. Similarly, each bedroom has been orientated to face a different natural phenomenon, namely the sunrise, the sunset, Songgot-bong and the Elephant Rock. 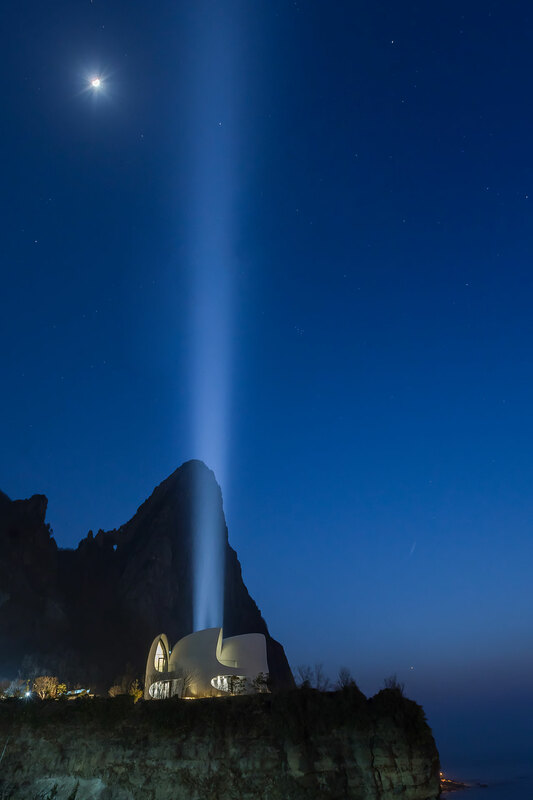 Villa Kosmos also includes two saunas representing the moon and the sun, an outdoors infinity Jacuzzi whose water is sourced from melted snow from a nearby volcanic basin and a wide terrace overlooking the sea where you can lounge under the sky. A private chef is also on hand to create a menu created by esteemed Chef Sunjin Hwang that combines local ingredients such as beef, cuttlefish and shrimp with a contemporary cooking style inspired by his work experience in El Bulli in Spain and Noma in Copenhagen. 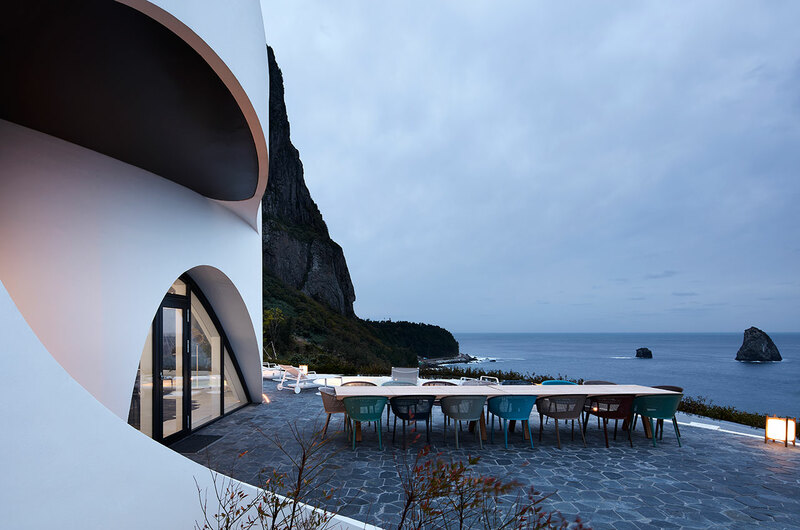 With most of Ulleungdo's tourist destinations in close proximity, the Healing Stay KOSMOS can also be a great launching pad for exploring the island, though once ensconced in the resort's luxurious comfort, otherworldly ambience and reinvigorating serenity, it may prove next to impossible to venture outside.